Saif Ali, founder of Integr8 UK, was a speaker on a locally and nationally renowned panel in this event. Organised by Open Hearts Open Borders, the event aimed to stimulate social awareness whilst informing, educating and facilitating ways in which individuals can support those who are affected by displacement. Other speaker on the panel were; Ahmad Al -Rashid (Syrian Student and Speaker – BBC Exodus: Our Journey to Europe), Baraa Ehsan Kouja (Founder From Syria With Love) and Juliet C Bill (Humanitarian – Independent Volunteer & Local Business Woman). In a sunny and warm day, 42 members of our Integr8 family enjoyed an outdoor picnic at Foxhole Community Garden. We light a fire, then we made hot drinks, camp bread and cooked popcorn and marshmallow desserts. After that we shared the delicious food that everyone prepared at home. Saif Ali, funder of Integr8 UK, was a keynote speaker at this workshop, which was organised by two PhD students from Exeter university to explore the challenges of working with refugees and asylum seekers in rural areas. 53 participants including, 8 volunteers and 2 facilitators spent a fun day out in nature, then at Arts Lab studio using art as a medium to explore their personal and collective visions. We ran this event in collaboration with Arts Lab Dartington. After delivering it in Plymouth, Saif was shortly invited to give the same talk at Totnes Consciousness Cafe, which was attended by 85 people who came from Totnes and surrounding towns. The event took place at the Jill Craig cinema in Plymouth University and was attended by representatives of many refugee-support agencies as well as students and other people who are still seeking asylum or had their leave to remain. Local people in Totnes celebrated Ramadan with 27 muslim members who came from Totnes, Dartington, Paignton, Plymouth, Torquay and Dawlish. We met every Friday throughout the holly moth and shared our home cooked foods over iftaar with Muslim people from Syria, Turkey, Iraq and Pakistan. The South Devon Refugee Support Network (SDRSN) put a series of events to celebrate cultural diversity and welcome for refugees in our area. SDRSN includes Ashburton Refugee Support Network, Beyond Borders Totnes & District, Citizen UK Ttnes, Darlington Hall Trust, Integr8 UK and South Brent Refugee Support Network. Saif Ali, founder of Integr8 UK, gave a talk at Refugee Support Devon’s workshop on campaigning. In this talk Saif shares the arduous journey that he went through while seeking asylum for 18 years and how that journey of adversity and loss gave birth to his life purpose and authentic identity. You can watch the talk on the TEDxTotnes website or directly on this Youtube link. 32 member of our Integr8 family met at Dartington and enjoyed a day of sharing foods, music, dancing together and beautiful walk around Dartington gardens. Olissa Fransisco and Jerome Wilks from State of Emergency facilitated a body movement and dance activity that Brough everyone together on the beats of hip hip music! We ran this event in collaboration with State of Emergency and Darlington Hall Trust. For the third time, we had a fantastic time learning about how to embrace cultural differences. we had 15 people from Iraq, Ghana, Pakistan, England, Scotland, Venezuela Jordan, Eritrea, Spain and France. All came together to build cultural and social bridges and explore what it takes to live as an intercultural community. We exchanged our cultural stories and learned about intercultural communication. We shared foods from all around the world that participants have cooked. We danced on Pakistani, African, Greek, Latino, English and Jordanian songs. Then we ended the weekend spending time in the green gardens of Dartington and shape our visions for a global culture that embraces all using Devon’s clay. Integr8 UK took the lead on founding the Refugees and Asylum Seekers Employability Network as part of Plymouth VCSE. The network is formed by refugee-support agencies that offer services that contribute to increasing people’s future employability. That includes Integr8 UK, Open Doors International Language School, START, and Workers Educational Association. Favourite Things, a local initiative founded by Inez Aonte, has kindly put a storytelling event that raised £270 for Integr8 UK. Displacement Studies is a research network based at the University of Plymouth with global partners and members. Please check full details here. 42 of our Integr8 family gathered to explore their dreams and hopes for etc future. People enjoyed a series of creative activities that we organised in collaboration with The Dartington Hall Trust and Foxhole Community Garden. >>> Read full story here. Recreo is an initiative led by students from Plymouth University to support displaced people to secure meaningful jobs by writing effective CVs. 18 participants from England, Germany, France, Sweden, Iraq, Iran, Afghanistan, England, Jordan, Kenya, Sudan, Congo and Eritrea joined this training and retreat at Dartington where they learned, played, spent time in nature, listened to live music, sang and danced, shared food, exchanged stories and connected with each other beyond differences. Check out full details about our cross-cultural retreats here. We celebrated one year of our work in Totnes, Darlington and Plymouth at the Methodist Church in Totnes. The event was attended by 55 people who donated Christmas presents to refugees and asylum seekers in Plymouth. The personal development programme was attended by 9 participants from Iraq, Iran, Afghanistan, England, Jordan, Kenya, Sudan, Congo and Eritrea, who started their personal and collective journeys in shaping a better world for themselves. The training took place at Open Doors International Language School in Plymouth. To know more about the programme please visit this link. Event was attended by everyone who attended or supported our first Integr8 program. 28 refugees, asylum seekers and other UK residents joined us at White House/Dartington, where we spent an eventful afternoon. We shared food from all around the world, enjoyed a nice walk around Dartington Estate and ended the day with Dabkeh (a Middle Eastern folk dance) over a famous Lebanese song. People got the chance to chat, share stories, deepen their connections each other and make new friends. The Mark Al-khadi, founder of and editor at Totnes Pulse, interviewed Saif Ali, founder of Integr8 UK, who talked in details about his life journey that inspired him to found Integr8 UK. Check the article under this link. 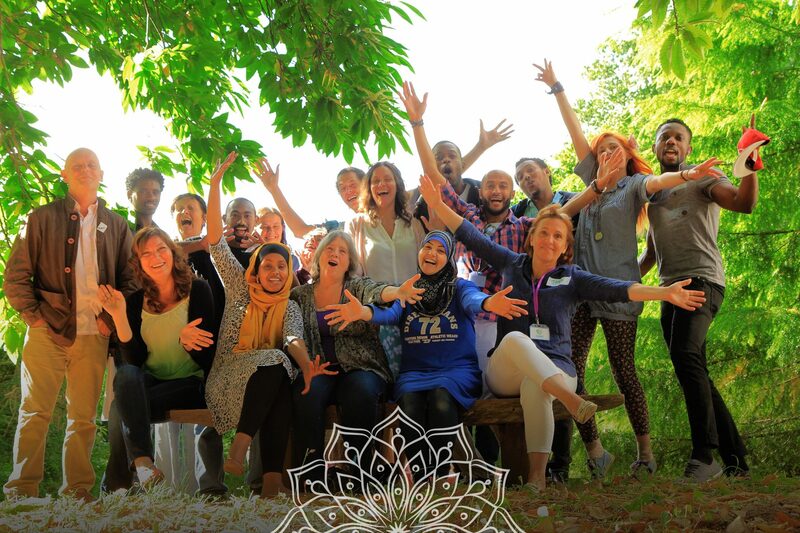 Launching our Integr8 programme by delivering a 4-day personal development training at Open Doors International Language School in Plymouth and running a cross-cultural retreat at Dartington Hall Trust. The successful pilot was attended by 20 participants who came from from different parts in the world like England, Somalia, Eritrea, India, Sudan, Congo, Poland, China, Puerto Rico, Iraq, Wales, Lebanon and Syria. Check full report on this programme (with photos and testimonials) here. When we first started our work we chose the title Embracing Refugees as a title for our organisation. But we decided to change the name to something that embraces both sides of integration to celebrate equality and move away from labelling people by a name that can sometime be demoralising. Integr8 UK and many other refugee support agencies took an active part in organising this event under the umbrella of the South Devon Refugee Support Network. This one-week festival took place in and around Totnes in support of refugees and asylum seekers. The Open Arms festival raised funds for local refugee support initiatives, highlighted debates around the subject and showcased literature and music of exile and immigration from around the world. We connected with ODILS through the Refugees & Asylum Seekers Network in Plymouth. We found a great resonance with their values, so we explored opportunities of collaboration that resulted in running 3 of our personal development trainings at their wonderful building. ODILS continue to show us their support in every way possible. Saif Ali, founder of Integr8 UK, decided to take the integration process to a different level and created the current Integr8 model. Integr8 UK was a key participant in this candlelit vigil and march from the plains to the Civic square in Totnes, organised by Citizen UK Totnes, to mark the 5th anniversary of the start of the Syrian conflict. We officially joined the RAS network that runs under Plymouth Volunteer Sector and Social Enterprise (VCSE). This network meets every two months to address issues related to refugees and asylum seekers in Plymouth are. March 19th: We are very humbled by the kindness that Proud2be organization has shown in organizing a jumble sale to raise funds for us and our sister initiative Beyond Borders Totnes and District. In collaboration with Beyond Borders Totnes & District Integr8 UK organised this event in Totnes to raise awareness about the sensitivities that need to be addressed when it comes to supporting asylum seekers and refugees. Abigail Grace, a Project Development Worker from Refugee Support Devon, explored some key issues that many of who us who want to support/ work with refugees and asylum seekers need to take in consideration. This was our second ever integration event. It brought asylum seekers and refugees with other UK residents to connect and build social bridges at Eden Rise – Totnes through fun activities, clay workshop, sharing food and music. This event was attended by 30 people from from different countries like, Iraq, England, Syria, Eritrea, Somalia, Saudi and Germany. Beyond Borders Totnes & District, The Darlington Hall Trust and Integr8 UK joined efforts to raise money to help refugees and asylum seekers to overcome social isolation and hardship in South Devon. With the generosity and kindness of 215 supporters we raised £9,625 in 14 days. Checkout link for our Crowdfunder video here. The Ashburon Refugee Support Network organised this event to raise money for refugee charities Save the Children and British Red Cross. Saif Ali, founder of Integr8 UK was the keynote speaker at this event. It was attended by 160 people and raised £600. We ran our first integration event that brought asylum seekers and refugees with other UK residents to connect at Eden Rise – Totnes. We used nature walk, art, various activities, food and music to help people build social bridges. This event was attended by 24 people from different countries like Syria, Kenya, Iraq, China, Israel, Eritrea, Somalia and England. Over 100 people came from as far afield as Bristol and Plymouth, including people from theater groups, newly-formed refugee support groups in other parts of rural Devon, from faith groups, refugees and asylum-seekers. Together we explored how to collaborate to be of real help to people in great need beyond our borders. As a result of the meeting, we fired many local groups that addressed different area of support. This day marked the launch of Integr8 UK (previously known as Embracing Refugees) in a public event in Totnes attended by over 200 people, plus representatives of other organisations and refugee-support agencies like; Plymouth Red Cross, Refugee Support Devon, START, Darlington Hall Trust, Beyond Borders Totnes & District. Sophie Pierce, a BBC Radio presenter and journalist, interviewed Saif Al and founder from Beyond Borders Totnes & District to promote the launching event of their two initiatives.